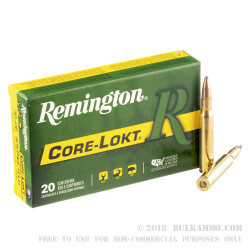 One of the rounds that made the Remington Core-Lokt and its tell-tale box in green and yellow, a legend, is this particular load. 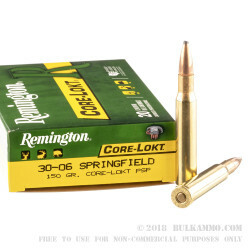 The 150 grain soft point .30-06 Springfield load in the Core-Lokt line is a proven reliable round that has a high weight retention on the projectile upon impact. The simple round composition and the overall top tier component selection (many of the components are produced under the Remington umbrella) make this a round that hunters have fallen in love with over the years. The enduring reliability and the decent price point means this is a proven winner in deer season. 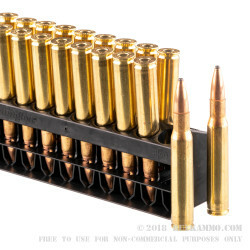 The 150 grain .30-06 load gives added flexibility to the .30-06 Springfield cartridge platform with the ballistics offering clean kills but the lower grain weight meaning it can acceptably be used on smaller game than the peak power and large projectile loads are ordinarily built for. This load features a muzzle velocity of 2910 feet per second and 2820 ft. lbs. 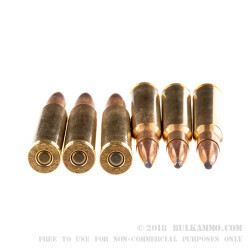 of energy but the 150 grain bullet offers a unique load for moderately sized game like deer and antelope. The 150 grain weight is not overkill, and can effectively drop an animal at that size where they stand.